DJM Capital Partners Inc has obtained $101.3 mil in non-recourse bridge debt for La Habra Marketplace, a 375k sf, 37-acre open-air regional shopping center in La Habra. Dual-anchored by two top-name grocery stores, Sprouts and Smart & Final, the property is in the midst of a repositioning project. Other credit tenants at the center include Petco, Ulta, Hobby Lobby, Ross Dress For Less, and LA Fitness. The financing was arranged by Steve Bram with George Smith Partners (GSP). It consists of $96.6 mil in initial funding and $4.7 mil in future funding for the development of a new pad at the intersection of Imperial Hwy and Beach Blvd. The pad is pre-leased to Starbucks and Jimmy John’s. The financing will also fund a tenant improvement package for a Regal Cinema lease extension that will include a wraparound screen for the 16-screen neighborhood cinema. The loan, which replaced existing senior and mezzanine loans on the property, covered closing costs and will fund 100% of future capital expenditures, tenant improvements, and leasing commission costs associated with the final stages of the property’s stabilization. The 24-month, interest-only loan has an interest rate of LIBOR plus 3.20%+. It offers three 12-month options to extend and has an origination fee of 75 basis points. Yield maintenance is 15 months and is open thereafter. Loan-to-value is 75% currently, dropping to 70% upon property stabilization, and the debt yield for the property is 7.8%. 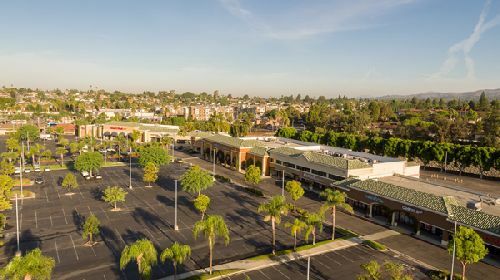 The Orange County retail market as a whole is also showing healthy fundamentals, with vacancy dropping to 4.8%, its lowest rate since before the recession, according to figures provided by GSP. Upward pressure on retail rents has pushed rates to more than $2.00 per square foot for the first time since 2010.